Wish, you are spreading your vibrant colors in nature, while execution your official tasks and not get so much stress with my presence. But today you have a little work to do, suppose you want to convert your EML format file to Outlook PST format file. If I’m right, then you are on right article here is the method to convert EML format file to Outlook PST file. So, before conveying the execution procedure to EML to PST Conversion format, I’m going to convey you slightly information about the EML format file and where it utilizes. Don’t go anywhere, keep tight your legs which must not move from your seat, until finishing the whole post. What is an EML format and what is it rolls? Simply, The File consist of .eml extension are EML files and utilize by a POP3 email application. Basically, these files are associated with the Outlook Express Software, which aspect of Microsoft and known as a POP3 email application. Infrequently, however other than Outlook email client can also create EML as well. 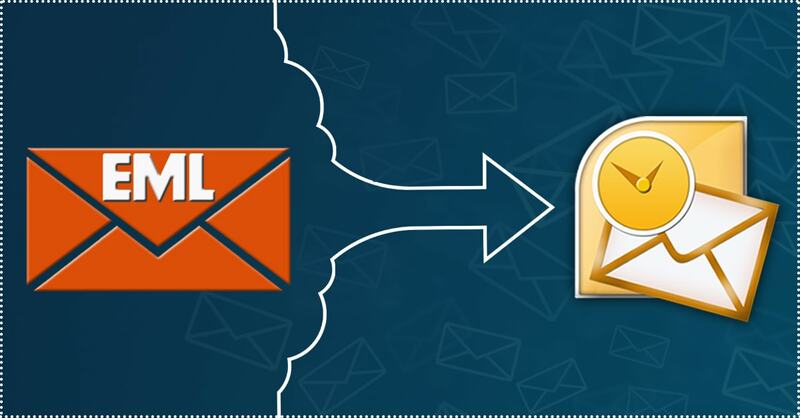 EML files are fully featured, EML file can contain the email message and also contain the attachment that was sent by the sender with the original messages. The EML file can also contain the hyperlink and joined attachments. EML files are usually saved in plain text format. The EML format file and PST format file both utilized by different renowned email clients Server for storing emails messages database with the attachment. The EML format utilizes by Window Live Mail, Window Mail Server while PST Format file utilizes in MS Outlook client server. The Microsoft has launched distinct versions of Outlook like MS Outlook 2000, MS Outlook 2003, MS Outlook 2007, MS Outlook 2010, MS Outlook 2013 and earlier version of MS Outlook 2003 with high security and aspect For operating easily more than one id in Outlook. Frequently People have to do migration execution to Outlook versions, but at the same time they want to import the old emails into Outlook. Which is not possible without PST file because Outlook adherence PST file only for storing email and the attribute, that’s why this being the reason behind the conversion of EML into PST format file. The Outlook Express, Windows Live Mail, Windows Mail, Eudora, Thunderbird, Entourage, and Outlook 2010 email client sever give permission to the user to save plain text message. The EML file can save mere one plain text message in ASCII standard or both that can include either the full-text header or text database. Such email client server like Outlook Express and Window live mail save text emails and attribute within distinct files of EML Format. Well, You can ingress to any of EML file format from supportable email client server versions. The EML file will not adherence with Outlook 2003, MS Outlook 2002, MS Outlook 2000 and before Outlook versions. However, Outlook 2010 for Windows and Outlook 2011 for Mac adherence EML file. Well, the good news is for you, if you’re windows user then, you can do the execution of conversion from EML files of any client into the PST format outlay with Outlook 2010. The steps are given below recommended to do same for the best result of conversion from Outlook Express EML to Pat outlay. Locate EML files and database of your system drive utilizing Search and Find option of MS Windows. When you get that EML file in the list of search or Find Windows, do right click on EML file. Go to Office application bar that appears at the top side of the message and then Right Click on Office Application bar. You will get all converted message in your Outlook mailbox with the given above step but it is good for only some file to convert. Yeah, you can convert and all EML message database of your system into PST outlay. But if you have large EML files into Outlook to convert then the manual procedure will not prove good option to execute the conversion of EML format to PST format. Furthermore, it is also not frisky to export EML files or POP3 mail accounts of a Windows Live network to Outlook with doing manual. Therefore, you should take assistant of the third party email migration tool to execute conversion of large or stockpile EML format files into Outlook directly. As you cannot successfully convert the large EML format file so utilize Shoviv EML to PST Conversion tool which is having equipped with multiple prominent features. Shoviv EML to PST Conversion tool helps EML to PST Conversion file with all database and attribute formatting and all other aspects. This software consists of fascination feature by utilizing its incredible feature. A user can readily convert multiple EML Format files to PST format at once. The orientation of Shoviv EML to PST converter software is simple as simplest, a novice can handle it friendly. This tool also gives you the option to convert Multiple Folder of EML to PST Conversion software while having required license. With this tool you can execute the conversion of the EML Format files into UNICODE PST format, which you can open on any given: MS Outlook 2003, MS Outlook 2007, MS Outlook 2010, MS Outlook 2011, MS Outlook 2013 & Outlook 2016. So, what makes you late to get this awesome EML to PST Conversion software for converting your EML Format file to PST format file. Have rest with the free fest, yeah install it free to test in your environment. Conclusion: I hope you perceive the conversion manual process and also have downloaded the gorgeous EML to PST Conversion software. The EML to PST Conversion software will help you more than manual process. You can start with the demo version of the EML to PST Conversion tool. If the tool satisfies your requirements then you can switch to the pro version of EML to PST Conversion tool to unlock many advanced features. Click on the free download button to get the free EML to PST Conversion tool.